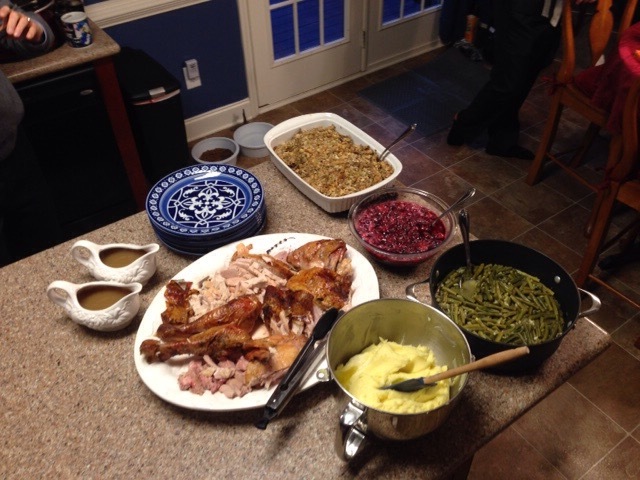 Thanksgiving is one of my favorite holidays because I really love to cook. Growing up I only knew of two ways to cook turkey. One was the tradition stuff the bird into a bag and place it in the oven. The second one was to deep pit it. In my personal opinion only the deep pitting of a turkey was exciting to me, but did not happen very often. That was until I was married and watching Martha Stewart. She showed how to cook a turkey using cheese cloth and basting it with wine and butter. Her turkey sounded so wonderful and looked beautiful. I thought to myself that surely I could make the same turkey. 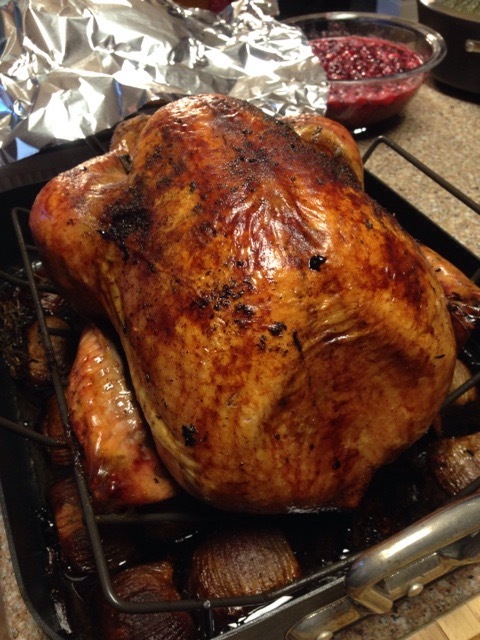 So that year I followed her recipe and my family loved my non boring turkey. After that I always made my Martha Stewart turkey. Over they years I have played with the recipe and finally perfected what my family now call my “Drunk Turkey”. Martha’s recipe called for only 1/2 cup of dry white wine and 1 stick of butter to melt and baste the bird with. Over the years I have tried different wines and finally settled on one that I really enjoy. Cupcake winery makes a lovely red wine called Red Velvet and this is what I use to baste my turkey. I use the whole bottle and 2 sticks of butter. Preheat oven to 425 degrees. Cut onions in half and peal. Place in bottom of pan to place turkey on top of to cook. This will act as your roasting rack. I use a roasting rack now, but still tuck onion halves under the rack. Thaw and clean turkey, pat dry with paper towels. Place turkey in pan. Take hands and gently run hands up under skin to loosen along top of turkey. Use soften butter to rub under skin and on top of skin all over tukey. Season with salt, pepper and poultry seasoning. Truss legs and tuck wings up underneath turkey. 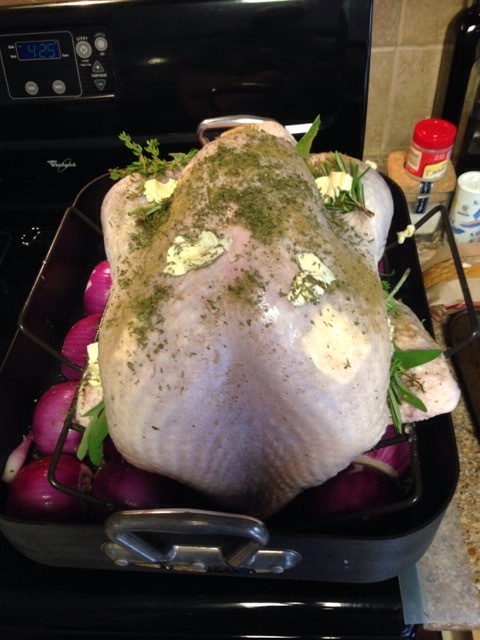 Place sprigs of fresh herbs under skin and in turkey cavity. Place one half onion in cavity of turkey. Melt remaining two sticks of butter and pour in bottle of wine. 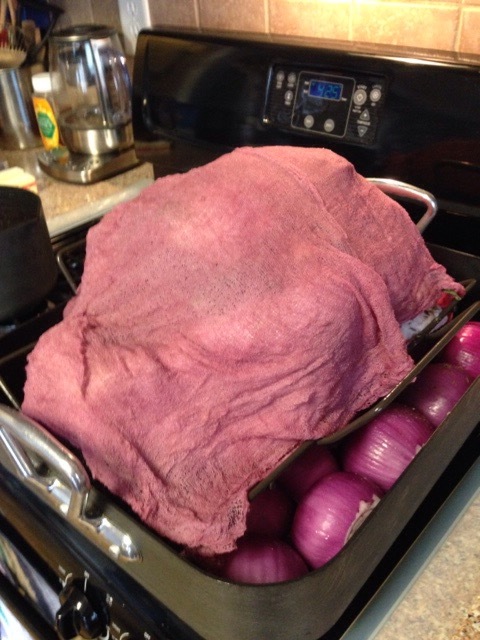 Dip cheesecloth into wine and butter mixture, then place damp cheesecloth over turkey. Cook turkey at 425 for 30-45 minutes. After 30-45 minutes, baste turkey with butter and wine mixture then rotate in oven. Lower temperature to 350 degrees, continue to bast turkey every half hour and rotate for even doneness. Remove cheesecloth after 1 1/2 hours. Check temperature on turkey at 2 1/2 hours for doneness. Turkey should register 165 degrees on the thickest part of thigh. Cook longer if nessessary. When turkey is done remove from oven, place on platter or cutting board and lightly cover with foil to let rest at least 20-30 minutes. Congratulations your turkey is now drunk but very juicy and tender. For gravy I remove most of onions from pan to serve on the side. Cooking down the drippings in pan on top of stove and scraping bottom of pan for extra bits. Skim off fat from drippings. Cook juiced down. Slowly add several dollops of sour cream to thicken gravy.